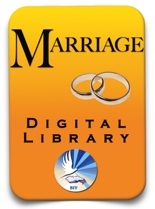 See all the materials on the BFF Marriage Library! Training toddlers and up. Seminar audio/videos! 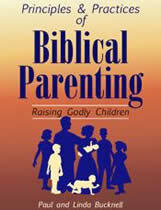 Principles & Practices of Biblical Parenting provides just what you need to develop a beautiful godly family! Everyone hopes to have a great family. You CAN have one too! Rev. Bucknell, a father of 8 children, has much experience teaching parenting and leader seminars here and overseas. 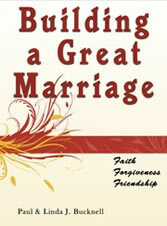 He has written extensively on marriage, family living and other Christian growth topics. Are your children young and out of control? Are you trying to get organized and maintain sanity in your home? Are you striving to implement godly standards in your children’s speech and behavior? Do you want to change the habit of complaining in your home? Are you trying to implement better routines for homeschooling? Do you wish your children would get along better with each other? 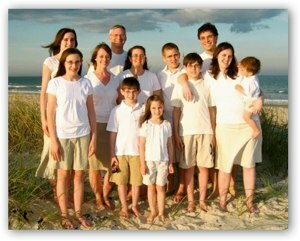 Are you attempting to figure out what a godly family looks like? Or perhaps you know something has to change but do not know what. Perfect to train children from toddlers and up! Downloads have no shipping costs! Get it even quicker. This first family special includes both the Principles & Practices of Biblical Parenting book as well as ongoing access to our Parenting Digital Library. Has all of the Principles & Practices of Biblical Parenting download materials including audio mp3s, videos, streaming, handouts and powerpoints! Check out the BFF Parenting Library for the amazing contents of this library available on USB Flash or ongoing download access. $8.00 off. Great deal! Principles & Practices of Biblical Parenting stands out among parenting books because it shows how God designed parenting to work – from toddler to teen years. This book maps out the way to a godly family and the means to enjoy the fruits from rich relationships and closeness with God. Table of contents, testimonies and description of authors including a recent family picture are below. 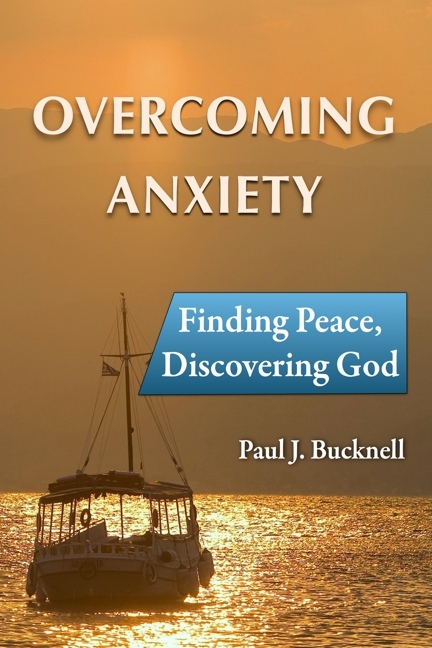 "It is Biblical and practical." "I learned that I can start to train chldren at an early age so that they will gain self-control and many other disciplines." "I liked looking at God's Word and learning how it applies to parenting." 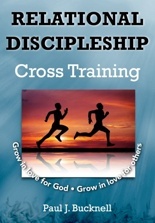 "Practical examples; practical tips that we can put into practice; Biblically based." "Very beneficial. 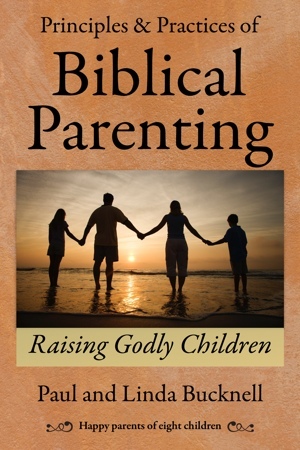 Both practical and "educational" in terms of knowing how to bring up godly children." "I like most the lesson about developing self-control for chldren... I have realized that the oneness between dad and mom is the basis for parenting a good, healthy and godly child." 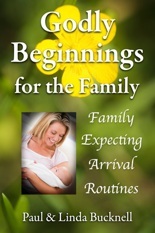 Helps parents adopt God's purpose for their family and understand their key role in shaping godly children. Develop a scriptural perspective of the responsibility, need and ability for husbands to work along with their wives as teammates in order to produce godly children. Gain a scriptural perspective of the parents' responsibility to govern their children and apply this to different aspects of disciplining children. Show the need and means of cultivating self-control in our children from an early age in order that they may please God and serve others. Enable parents to understand, use and create effective routines to further their parental training. Develop a scriptural perspective of how to properly deal with disobedient children so that they might become joyful family members. Develop a scriptural perspective of chastisement and describe ways to properly administer the rod. Enabling parents to understand how to set up, implement and maintain proper and effective boundaries for their children. Developing and applying biblical principles to provide proper spiritual care for our children. Enable parents to show God's love and truth to their own parents and in-laws during visits with each other. Help parents of older children and teens to regain the hearts of their children who have not been well disciplined or tenderly loved. Describes our own 30+ year trail to become godly parents along with all the ups and downs. Many personal accounts of raising our eight children bring alive all the former lessons. Appendix 1 Biblical Parenting, Really? We (Paul & Linda) have been married 30+ wonderful years and have been raising children for all but one year! These years have humbled and challenged us, taught and sanctified us. This has not changed much with four teens at home and now homeschooling five children! Family life has been enriching. The joy from our eight children deepens even further with visits from our two nearby grandchildren (did you see the video above?). Principles & Practices of Biblical Parenting carefully presents the teachings we have observed in God’s Word and how they affected the way we raised our children. We wanted more in this book, though. We also share with you practical ways we have guided our children in various situations from tots to teens because of those Biblical truths. We took a long time to learn these things but hope you can learn and quickly profit from them from this book. 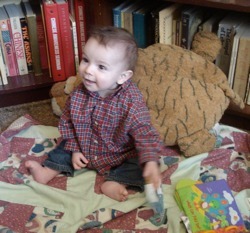 On the left our grandchild plays in Grandpa's study without touching his books. New generation, same Biblical teachings. Please note our promise of ongoing access to our libraries is what we would like to provide our users. There may be an unforeseen day when changes in the internet make this impossible. As a result, if for some reason we cannot provide ongoing web access to these files, then we will, if at all possible, warn you of the upcoming change and ask you to download what files you would have. If it is more convenient, then we can ship the library to you on a Library with a $5.00 surcharge (what we now charge). If it makes you more comfortable, please download the files you want and burn them on a Library. We may at times change where the files are located. Please keep and use the original email address (or mention it) to contact us. – Seeking openness and honesty.